I'm not usually one for buffets, although Z. is and I greeted his finding of this excellent buffet with some scepticism. All-you-can-eat and a meat place, especially with a non-descript name like Smokehouse? Sounded like a recipe for gastro-reflux or worse a re-run of teenage memories at Seoul Garden. Since then, I've had to eat my words and my public service announcement is to blog about this place before their attractive weekday offer ends at the end of this month. This place is opened by Kuriya and from what I discovered online, it is meant to be a pay-as-you-go place to experience Japanese meats. 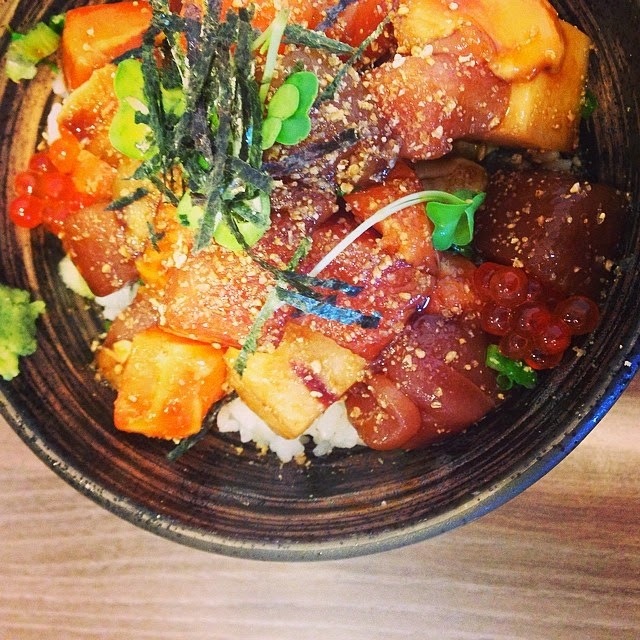 The idea is that you pay a cover charge for the salad bar and side dishes, which are not insubstantial, as it runs the gamut of a very tasty chicken soup and miso soup, to kim chi, pickles, daikon, mesclun salad and toppings like tomatoes, corn and edamame, as well as garlic and white sushi rice. 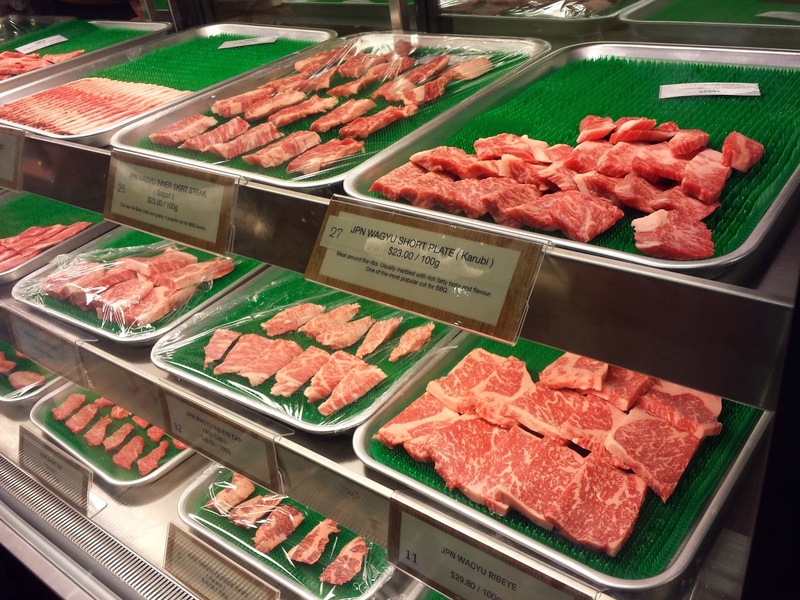 You then choose your meats by the 100grams, from an Isetan-like counter and pay for those. You can also choose and pay for beers and desserts. The supermarket-like greeting area of the restaurant is fascinating, varied products from Japan like packaged cakes, salad dressings, and all manner of foodstuffs that make it really fun to browse or at least peruse all that's on offer. You can then DIY a BBQ at their Korean BBQ tables, atop fresh red-hot charcoal buckets. These sticks of black charcoal greet you in a glass-fronted display when you arrive at Smokehouse, there is something really evocative and primative about that. This is juxtaposed against the Japanese supermarket meat counter and then the whole concept is laid out in a stick person diagram similar to those at petrol kiosks, that I found simultaneously very Japanese and very Singaporean. I guess the good people behind Ichiban Boshi were trying to do for meats what they had done for fish in the form of takeaway sashimi and sushi. I'm not sure if it will take off and I heard that they had some teething issues, including a few days when the whole restaurant was shut for technical issues. 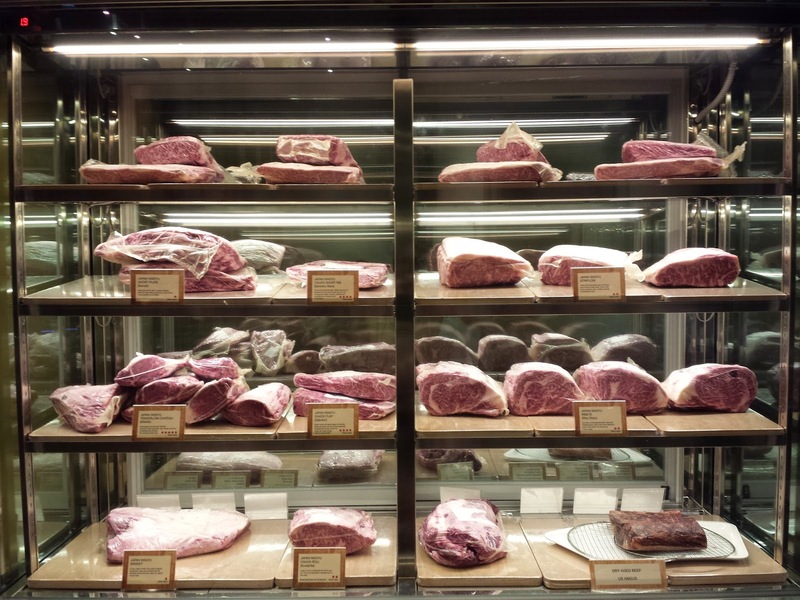 This might have something to do with why they are now running a promotion for an all-you-can-eat on their meat counter, for $60 at weekday dinners and $23 at weekday lunches, but without wagyu meats. On weekends when they presumably don't have a problem with crowds at Great World, this same deal costs twice as much ($120 for dinners). 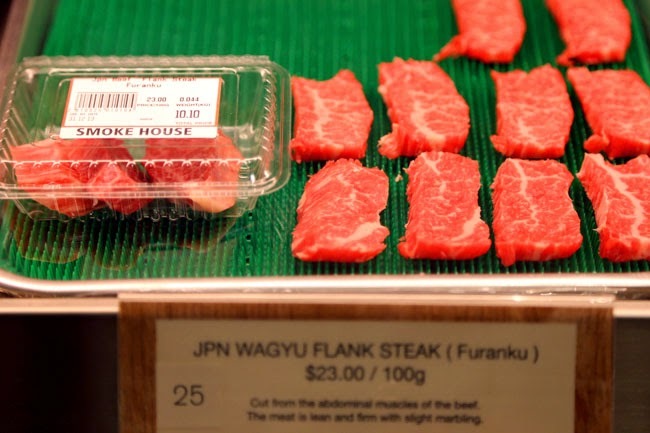 For $60, it really is great value, as long as you can prevent yourself from stuffy your face of oily, rich wagyu. It sounds rather unbelievable but you can really go up to the counter, which looks an awful lot like the Meida-Ya or Isetan meat counter and pile up your cooking platter with 10 slices of thick Japanese wagyu rib-eye, 10 slices of fresh marbled Japanese wagyu short ribs, 10 slices of premium beef tongue, 10 large cubes of wagyu beef tenderloin , 10 steaks of dry-aged USDA prime rib, 10 slices of kurabuta pork and just for good measure the enoki, shitake and king mushrooms please. It is slightly mad- you don't even want to waste your time on the Australian and USDA beef, because you should concentrate on the Japanese wagyu. Far from being stale and cheap, the cuts of meat are fresh and red, they look beautiful, like Japanese supermarket cuts and nothing like our wet market beef or even the dark purplish hue you sometimes see off frozen beef at Hubers or Indoguna, before they have been aired. They list out the provinance of each type of meat and cut and you can have anything from thin slivers of shabu-shabu to thick steaks. This is clearly, not the kind of place for vegetarians, pescetarians (although there is a prawn, fish and scallop offering, it did not look as great as the meat selection) or young children. We really enjoyed ourselves, though the second time I went back, I ate with more restraint! You should definitely try it before the promotion runs out, as I'm not sure it will be maintained afterward when it goes back to a 100 gram pricing. I guess it has been so popular already that they plan to rescind it at the end of the month. If there is one place where people take photos of their food, or rather photos of themselves receiving their food, it must be Teppei. 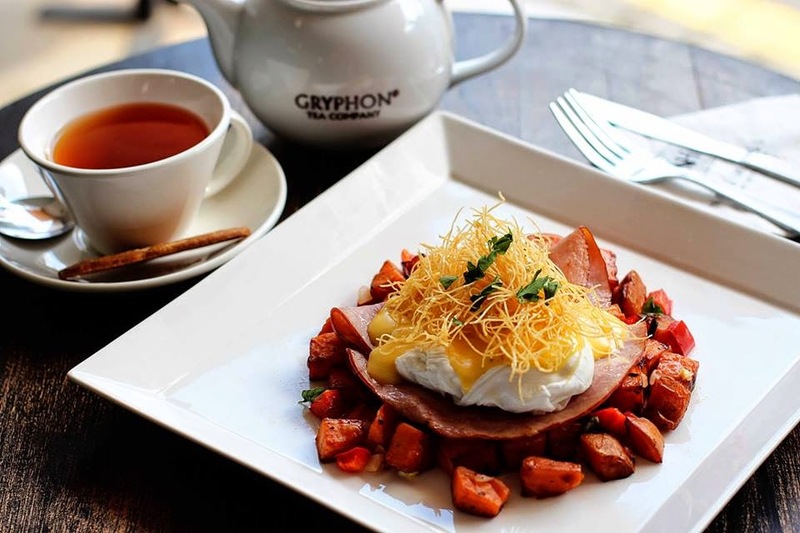 Unless you've been hiding under a rock, you must have heard of this little hole-in-the-wall where people queue for hours for food, in Tanjong Pagar. I myself walked by this place for months, always ogling the crowd and only belatedly kicked myself for not making a reservation earlier for their $60 dinner omakase. By the time I tried it, it was a choice of $50, $60 or $80 dinner omakase, that had wagyu beef and sushi as the margin-inflating extras. As with all places that you go to with high expectations, it was inevitable that it should disappoint at dinner. But at lunch, where I had queued just a few days before, it was indeed a triumph to get a seat and I felt richly rewarded by the barra charashi that I'd seen online again and again. Let's be clear, there is definitely a strategy for eating at Teppei. 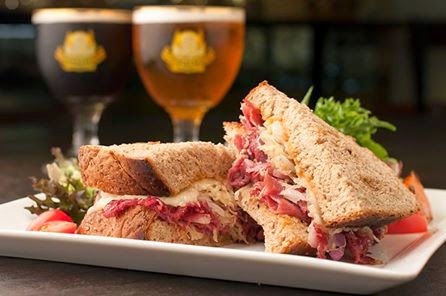 Lunch opens at 12 noon. The queue begins at 11am. There will be enough people in the queue, by 11.45am, to seat both the first and second seating. However, there is a lull at about 12.45pm when the whole of the first seating will have left. My observation after a few times, is that if you begin queing between 11.45-12 noon you can get into those slots. You will most definitely get there if you are in a group of one or two people, in fact, people who go alone get to the head of the queue all the time. If you have four people, you are out of your mind. They won't seat you before your whole party arrives. And should you miss that 12.45pm slot well, then you will be waiting a long time. I think they do about 4 turns every lunchtime, at approximately $50 per two heads, that's 18 seats multipled by 4, and then $25, which is $1800 and an additional 50% takeaway, or $2700 revenue for each lunchtime. Which although substantial, actually isn't much for how hard the chefs work, and how many extra hands they hire. You'll see what I mean when you go. The cheerful obliging man behind the counter is Yamashita Teppei, who hails from Fukuoka, Japan. The dishes at lunchtime are largely tempura priced at $16-19 and the barra chirashi at $16 which is a very decent mound of sashimi served in sauce atop a bowl of Japanese rice. There is a new special everyday, the day we were there, it was yellowtail sashimi and what we discovered after a few goes is that you can customize your barra chirashi (realized this because one barra chirashi is rather small and leaves you wanting). You can get an upsized barra chirashi, or one with tempura for $24. Given the limited lunch menu, and the appetizers which you pick from table tubs- I believe it was hijiki seaweed, a small pot of oden and stir fried shredded pickled radish, the service is fast, efficient and hot. It is always really hot inside this place, but inside, the cool mix of ikura and chunks of salmon, tuna and scallops, topped with a yuzu ponzu and pea sprouts, is refreshing against the warm rice and the world is good. The chefs are buzzing and although everything is served out of plastic bags and packets, this place has a dive-bar type atmosphere that makes it kind of hip. I have to admit that going in for dinner, was not without reservations. Haha, a good pun since reservations are what indeed you will need, the place is booked solid for most of the year and opens again in September for October-December reservations. I had seen pictures from my friends and between the rough thick sashimi, the random skewers and the slightly wobbly food texture, I had my doubts, but when offered a chance two 6.30pm seats late in the day by a absentee friend, I felt I couldn't turn it down just the way I suppose Singaporeans queue for Hello Kitty, or Taylor Swift tickets. Just because it's rare! I don't know if there were really 22 courses, I didn't count but it's true that there were many many small plates. I felt a bit cheated that many of them were poked on satay sticks, like one broad bean, one thin sliver of Japanese tomato, one leaf of 'ice vegetable' that was handed to us by the assistant and one crispy orange little crab, also shoved onto a satay stick. The sushi was handed to you, in individual metal spoons. Those were 'courses'. One broad bean is not a course. Not in my book anyway. There were also little itty-bitty saucers of again, sauteed dragon's beard vegetable, oden and three sad-looking char-grilled edamame (tasted the same as non-grilled edamame). There was an unappetizing, small salad that was served at room temperature, symptomatic of the lack of refinement in the food, just stuff served out at a breakneck pace. A plate of four or five roughly-hewn sashimi, salmon, salmon belly, tuna , hamachi (yellowtail) and swordfish. A deep-fried tiny fish with a slice of lemon. A slice of meaty fish tempura, with a slice of lemon. A bowl of ten littleneck clams, served in soup with a lemon. The clams were sandy. 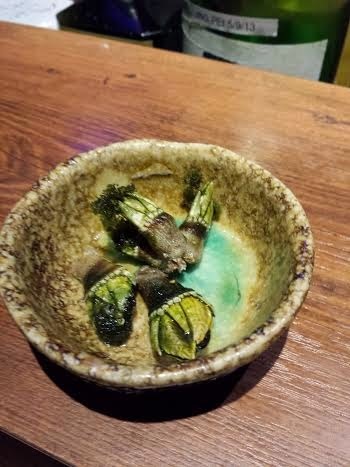 There was a small saucer of what the chef and assistants told us were Dinosaur. "But what is it really, is a clam or a barnacle", as that's what the gnarly footed shape looked like. It's Dinosaur, they said blankly. For the record, when you break off the shell, it evinces a small red flesh, similar to a crab leg, though not as chewy as a sea snail. Everything tasted, a little briney. The fish tasted a little briney, the crab, the dinosaur, even the ice vegetable tasted briney. It just didn't taste fresh and the mouthfeel wasn't right, it wasn't turgid and distinct. For $80, I feel that I can get a full sushi/sashimi meal, at a decent if mid-range place like Hakumai at International Plaza or even Akashi, so it didn't feel like a steal and I walked out feeling slightly moorish in the mouth, like when you've binged on over-oiled yet slightly tasteless supermarket sashimi. The buzz at dinner, was quite different from lunch, when the air was cooler (but still smelly on the clothes) and you ate with a line of people outside. At dinner, the area is deserted (it is Tanjong Pagar, after all) and the restaurant just seemed to get hotter and hotter as the two hours wore on. The shirts stuck to our backs and it became actually a bit unpleasant, especially as you could see the chefs busily preparing the next courses for the next seating at 8.30pm. The best courses, I felt, were the Negitoro handroll. It came wrapped in a crisp seaweed with flavourful soft negitoro, wrapped with crispy tempura bits. The tenkasu really made the roll. I also liked the uni scallop sushi, the shabu chutoro, the chawamushi (pretty regular but tasted of milk and sweet potato at the base) and the slice of wagyu beef fried with crispy garlic and scallions. By the time we came to the mains I wasn't so much full as I was, tired and confused from the array of little tastes and dishes. The choices are Fried Rice with Sunny Side Egg (spicy), Sashimi Rice, Soba(hot or cold), Udon (hot or cold). I was hoping the sashimi rice might be the same as the lunch's barra chirashi, but it was instead, four metal spoons, containing four kinds of small sushi. I had the hot udon, which was plentiful with pink-rimmed fishcake and wakame. Dessert was the choice of a scoop of Yuzu, Green Tea, Sesame, Calpis or Salted Caramel ice cream. All in all, it is a decent amount of food, if not a lot of food, for $80, but I think the sweet spot in pricing is probably $60. It isn't very good quality and I dare say the standards have dropped as the restaurant has become really busy (I've personally experienced this even with the takeaway at lunch), but for an experience with friends, I would definitely still go for lunch, though probably not for dinner. I didn't manage very good photos at night because of the low light but there are many reviews online that have lovely pictures that make the food look very appetizing like here at PinkyPiggu and here at SGFoodonFoot. I was introduced to this place by a friend and even though I live fairly close by, I had never even associated the building with a bakery. 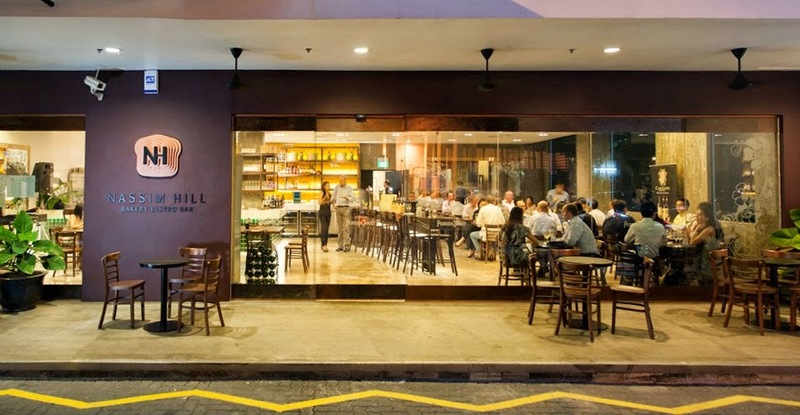 This is a bakery-bistro-bar (in the morning, lunchtime and at night) that is sited at the back of the old Tanglin Post Office, behind Swiss Butchery and in what used to be the Friven headquarters. The building is a hodge-podge of businesses that doesn't really make sense to me. Even the entrance, is either from the drop off, where these days, all the obscenely expensive super cars get to park, or else in the basement carpark via the cargo lift that I presume is used to transport furniture up to Domicil on the top floor. It seems very hard to fathom that it could be home to a good food outlet or bakery. Odd though it is, this place is absolutely fantastic. This casual place is by the same group, Imaginings Pte Ltd, that owns KPO. I'm glad I didn't know that before I went, because I would have had the impression that it was slick or overpriced. The interesting thing about this place is that it doesn't really have much character, cement screed industrial floors, regular dark brown wood ones, the servers were yellow beer-sponsored tee-shirts- you know, it's just regular. It has random touches like a huge marble counter and stained glass panes, which are as inconguent as they are quirky. But the food is excellent and consistent. The eggs are rich and nicely scrambled, the pancakes are fluffy, the banana foster french toast is thick and the fish and chips ($23) have a wonderful, crisp beer batter which puts it in at least the top three if not the best that I've had in Singapore. 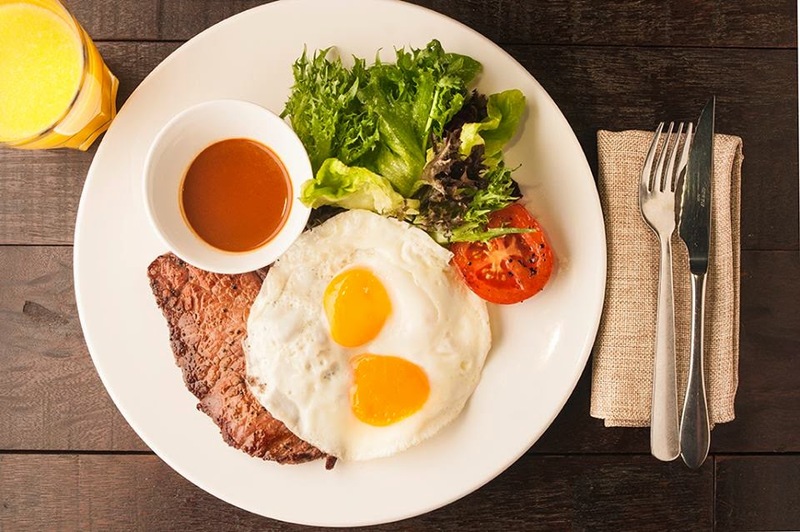 The steak and eggs, or spanish eggs are very good, as are the sandwiches- ham and emmenthal cheese sandwich on walnut cranberry bread is particularly delicious and the hot rueben on Austrian beer bread was warm, juicy and massive. Everything comes with a side of salad, fries and a large variety basket of warmly, freshly baked bread, which is quite a luxury. They bake all their bread daily and I am told that it is baked and bought in by the artisan baker at Killiney. 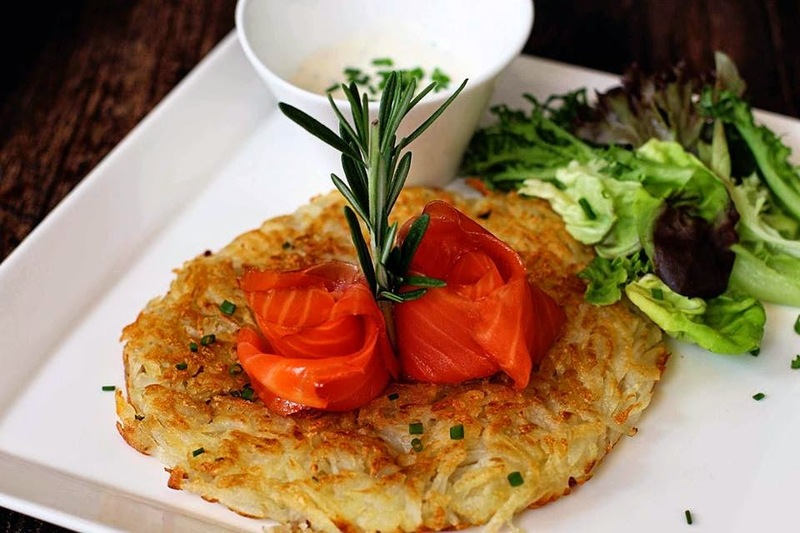 Over the Easter weekend, they had specials of potato rosti with smoked salmon, sweet potato has, waffles and ricotta hotcakes- it was great to find a full menu that actually draws you in! 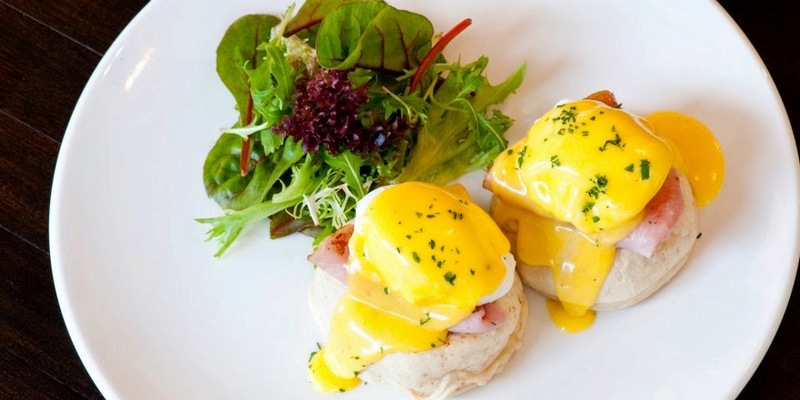 There isn't any service charge (granted, service is a little hectic when the place is full as it can get at weekend lunch) and the meals are priced at $15-18 for eggs, $18 for sandwiches and $17 for salads. The helpings are probably the most generous of any brunch place that I can think of. 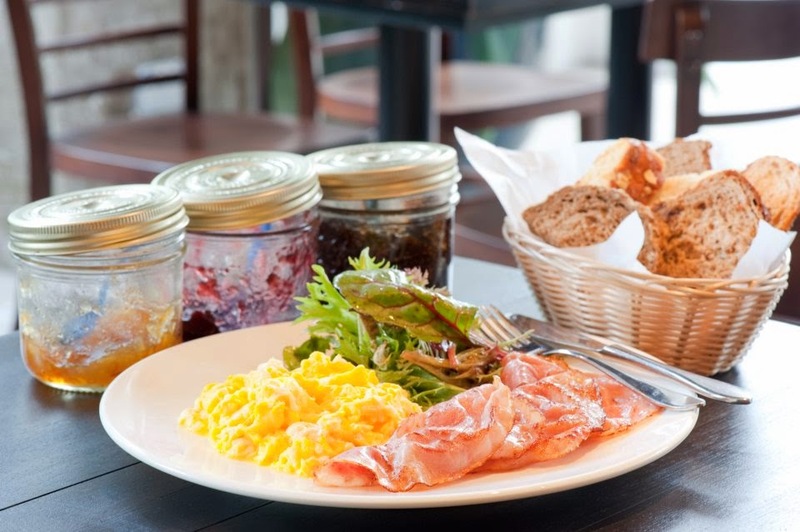 I like that there is ample choice with five pages of brunch, sandwiches, salads and pastas and also that the layout of the place is spacious and if you go in the morning for breakfast, fairly empty and peaceful. 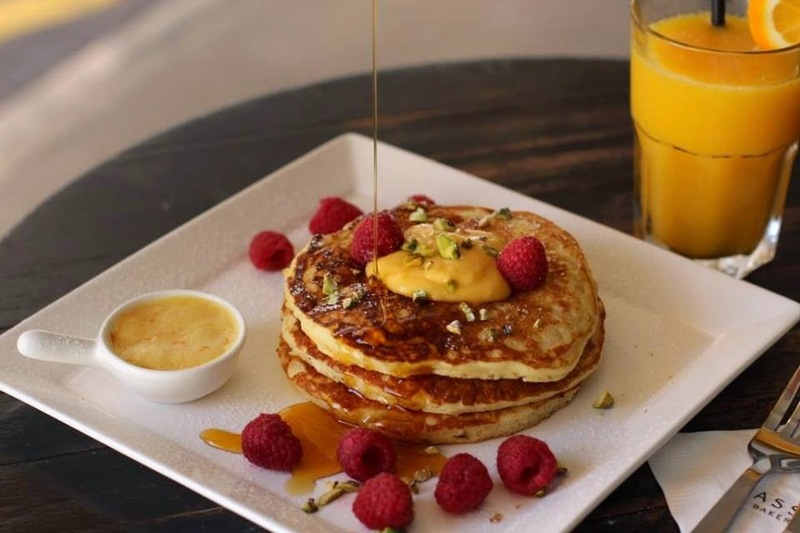 All pictures courtesy of Nassim Hill Bakery's page. For more tantalising photos, check out gninethree's review in pictures here. I always laugh a little inside, when people say, "you haven't been updating your blog these days, you haven't been eating out izzzit". Oh, if only that were true, I would have to resort to many days of salads to try to keep the bulge down (this is my second day of pure salads, so excuse me if the post is a little grouchy, I get really grumpy and start craving tiramisu and pizza by about Day 2). Actually, we have been eating, making our way through the names slowly but surely. It's just that I've been trying to find inspiration to write about what we've been eating and many times I am just not that inspired, because the place isn't that differentiated. Also, I find that with the new trend of hip, casual places, the menus have become a bit more, dare I say, disjunct and sparse, such that it seems disingenously less than a full review to write that I found this place, that only serves, 7 kinds of burritos and 4 flavours of San Pelligrino sodas. I could tell you about Assembly's great coffee and their 7 brunch items, but 4 of those were scrambled eggs done different ways. It would be the stuff of a Facebook post, but not necessarily a review. 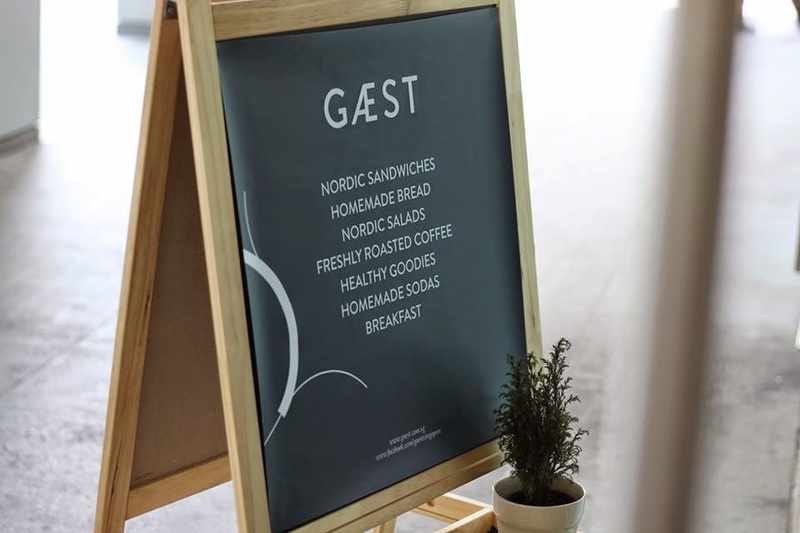 GAEST or 'guest' in English, is a place that has opened in the Tanjong Pagar district, in the buzzing district of Mc Callum Street, just a couple of spots away from the lovely SPR MKT. This place is tiny, so a strike against it for me is the kitchen or sandwich preparation area, which is merely a bar extension of their coffee counter. 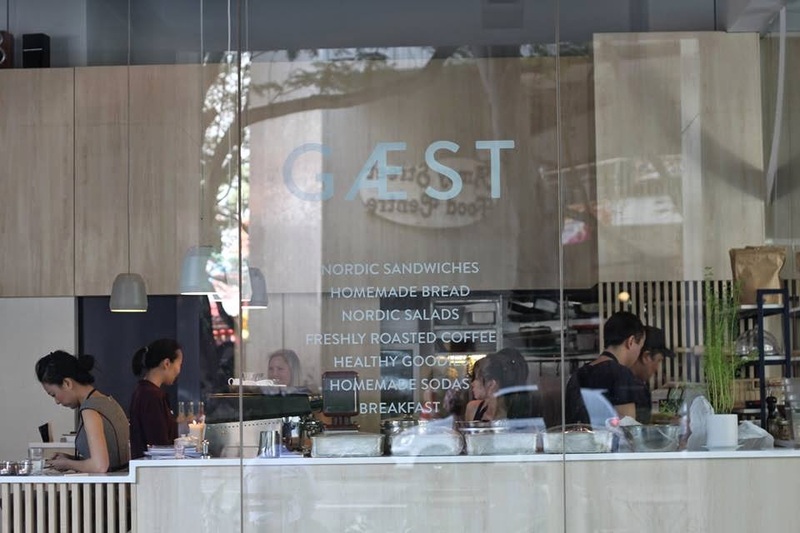 They are a brand new clean-cut Scandinavian place, although personally, I didn't really see anything particularly Scandinavian except that the sandwich features potato and the decor is light wood and IKEA-rised lights (but isn't everything in Singapore these days?). This unit was last a coffee shop and sits at the foot of the boutique apartment block, the Clift. There are only three tables indoor where the door is left open and the rest of the seats are outdoor or for takeaway. As I mentioned, the day I was there, the staff were busy and noisily chopping the roast pork and bread on the tiny counter, so I was a little underwhelmed. I was told that they make their bread daily and their roast pork, at their homes, which is real committment. What I liked about it were the friendly owners and the bread- the sourdough bread had a proper sour kick to it and I couldn't stop eating the crust, it was so sharply delicious. 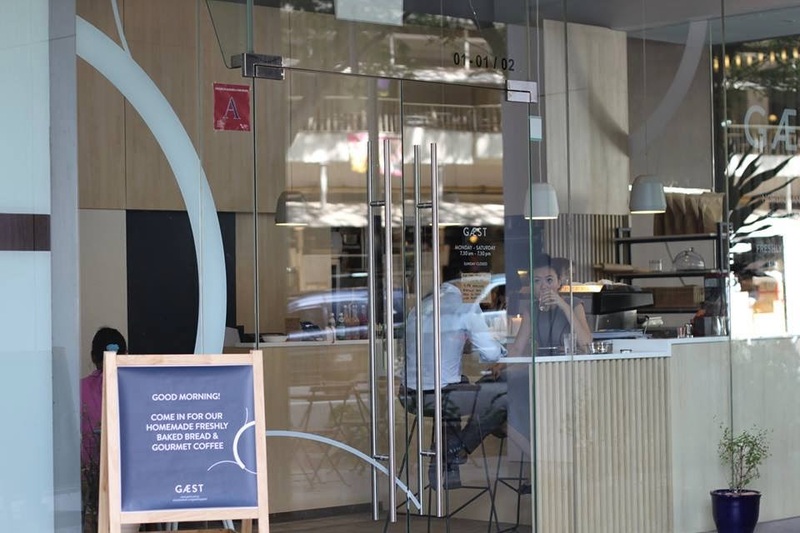 That being said, the sandwiches, while more bespoke, are pretty small, a little dry and at $15, not terribly good value, as they are much smaller than those at Nassim Hill Bistro or just around the corner at Cedele or the Sandwich Shop. We tried the potato sandwich, the roast pork sandwich and the chicken sandwich. 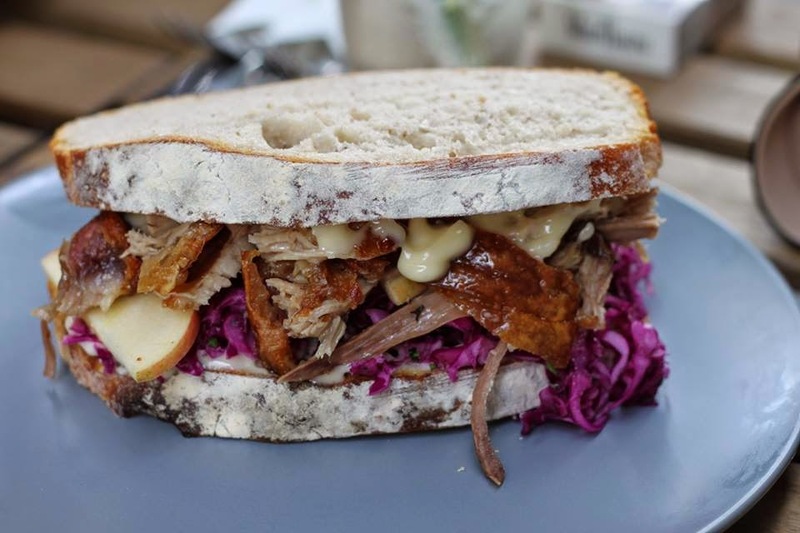 I make roast pork crackling and smoked pulled pork at home, so I was not taken with what it was, but I liked the use of more varied ingredients, like pea tendrils, hazelnuts, sliced apples and rye crunch in the sandwiches. I could not taste the cranberries that were meant to come in the pork sandwich, but it was indeed the best of the three, with the chicken being the plainest. The salad, which was a heaping of mixed vegetables and citrus fruit seemed a much better deal, so I will try that next if we return. We were the only Asian table there, I guess not many consider a sandwich and coffee for below $20 a good deal- but the place looks like they are doing good business nonetheless!